The “Young Innovators 2015” meeting, organised as part of the Festival of Science, was held on 26th September in the Staszic Palace in Warsaw. 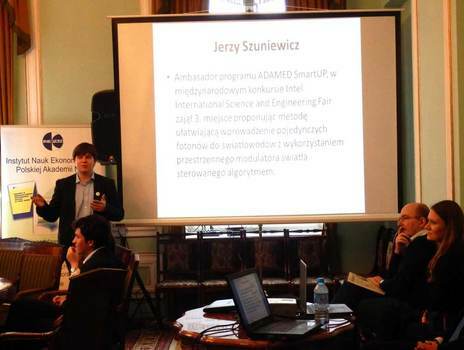 Among the speakers – laureates of nationwide competitions for young scientific talents – was Jerzy Szuniewicz, ADAMED SmartUP ambassador. Jerzy told the Festival guests about his projects and achievements, as well as challenges that young people have to face at the early stage of their scientific careers. In one of the later presentations, Anna Kosińska, ADAMED SmartUP Project Manager, acquainted the audience with the programme’s tenets and underlined the fact that initiatives offering young people a chance to develop their ideas, talents and academic ambitions deserve to be promoted. A participant of the meeting was also Maciej Adamkiewicz, Adamed Group Management Board President and Adamed Group Foundation Management Board Vice-President, who reminded about the opportunities provided for young science enthusiasts by growing business-science cooperation. Also present at the meeting were other nationwide scientific programmes, as well as the presented profiles of young, talented innovators and scientists. The lecture and presentation session was followed by workshops organised by Prof Tadeusz Baczko’s team from the Institute of Economic Sciences of the Polish Academy of Sciences. The workshops were inspired by the model of the Austrian economist, Alexander Osterwalder, and summed up the opportunities for streamlining the education system and possibly even commercialisation methods of new ideas in the economy.